A stunning bilingual story by award winning author and illustrator Yuyi Morales. As the long day comes to an end, Mother Sky fills a tub with falling stars and calls, "Bath time for Little Night!" Award-winning author and illustrator Yuyi Morales is the author of Caldecott Honor and Pura Belpré (Illustrator) Medal-winning Viva Frida, stunning bilingual bedtime story Little Night/Nochecita, Rudas: Niño's Horrendous Hermanitas, Pura Belpré Honor Book (Narrative) Just In Case: A Trickster Tale and Spanish Alphabet Book, and other picture books for young readers. She also illustrated Thunder Boy Jr., written by Sherman Alexie, and Pura Belpré (Illustration) Medal and Pura Belpré (Narrative) Honor book Los Gatos Black on Halloween, written by Marisa Montes. Yuyi Morales is an author/illustrator whose books have won the Pura Belpré Award, the Christopher Award, and the Jane Addams Award. She lives in northern California. Her books include Just In Case, Viva Frida, and Little Night/Nochecita. 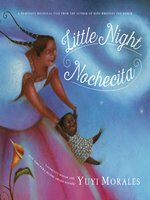 "Children will delight in Little Night's dreamy world and will want to read about her unique, yet still familiar, nighttime ritual again and again."